No doubt the past few weeks have been hectic for all of us as we strive to make memories for our families, take time to reconnect with extended family and friends, give of our time to others and, in a sense, try to accomplish those things that we said we would do in 2013. So here it is 2014, and it's time (like it or not) to set some goals or resolutions for this year. Suggestions for resolutions abound, and this issue of Lovin'Lilburn gives some ideas. Culling from newsletters and web sites, we give you gleanings on a few changes going on in our community and some ways to improve your health (and your pet's) and our environment. Also, you will find some updates from the CID, City and County. See the side bar for contents, events and links to calendars. As always, we include a few items from contributors. As a final thought on resolutions, check out a recent column from Susan Larson in the Gwinnett Daily Post on New Year's Resolutions with a message that giving without any expectation in return might be the best resolution of all. Recycle your Christmas tree at any Gwinnett County Fire Station as well as at the City of Lilburn drop-off location at 107 Railroad Ave (across from City Hall). Just remove all ornaments and lights and drop them off at any time between now and the end of January. Trees will be mulched and used in public areas and parks throughout the County and the City. 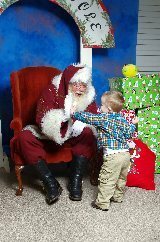 Santa's late December visit at the Beaver Ruin Shopping Center was enjoyed by children and their families. 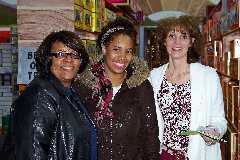 The event was co-sponsored by the Lilburn Community Partnership and the shopping center. Volunteers (businesses and residents) made the event especially memorable. Photographer Richard Ferris uploaded professional photos for families to download free. It was a great day with lots of memories made, and a big box of canned goods was donated to the Lilburn Co-op. See the LCP Facebook page for more photos. Whether business operator or resident, make plans to attend Business After Hours sponsored by the Lilburn Community Partnership on Thursday, Jan. 16 from 5:30 pm until 7:30 pm. This month's meeting will be hosted by Elite Signature Enterprise event center located at 850 Indian Trail Rd. (at the Burns Rd. intersection) and will feature a presentation on Community Improvement District 2014 projects. Refreshments by Chef Michael of Spice of Life Catering will be served and set-up/decor will be by Jade of The Special Occasion. Business operators are welcome to bring a door prize. Contributing business owners will have the opportunity to introduce their business as they give away their door prize. This is the second Business After Hours presented by the Lilburn Community Parntership. For pictures of our successful November event, check the LCP Facebook photo album. For more information contact Diana Preston through info@lilburncp.com. New Traffic Plan for Parkview H.S. Effective Tuesday, Jan. 7th, there will be a new traffic pattern at Parkview High School. The change will provide a smoother drop-off and pick-up experience for those using the drive closest to Camp Creek Elementary School. Drop-off/pick-up will be at the back of the building. Traffic will proceed up the drive adjacent to the Camp Creek campus to the stop sign, turn right and drop-off/pick-up students at the overhang behind the building. Vehicles will then proceed around the parking lot and exit via the same drive. When exiting, only right turns onto Cole Road will be permitted. Barricades will be in place preventing access to the portion of the parking lot where student drop-off/pick-up has been allowed in the past. Signs will be in place indicating "no student drop-off/pick-up." Parking lots in front of the building in this area are reserved for faculty parking only. No student drop-off/pick-up is allowed in those lots. Click here for further details on the school's web page regarding Parkview's traffic patterns. Few problems cause a homeowner more grief than a backed up toilet or sink. Gwinnett County has one of the most advanced sewer systems in the world, but even the best systems only work if the wastewater is able to make it to the treatment plants. The leading cause of collection system failure is fats, oils,and grease that build up in the sewer lines. Collectively known as FOG, fats, oils, and grease cost the County hundreds of thousands of dollars in damage and time spent removing it from the pipes, lift stations, and plants. Fortunately much of this damage can be prevented simply by making sure FOG doesn't get into the system in the first place. The best way to prevent FOG from causing clogs is to put as much food waste in the trash as possible. Remember the drain is not a dump. So what can we do about it? A good place to start is banning the garbage disposal. Garbage disposals simply chop clog-causing food scraps into smaller pieces; they don't get rid of them. Scrape leftover food from dishes and cookware into the trash before you wash them and pour grease and oil waste into containers to throw away. These simple tips will help make sure unwanted sewer backups don't ruin your fun. For more information on Gwinnett's FOG Program, visit www.unclogthefog.com. The City of Lilburn is starting the 2014 with a bang. After a hiatus of a few years, the police department is bringing back its very popular Citizens' Police Academy. The program consists of 10 classes and starts February 11. Participants must meet several requirements, such as being 21, having a drivers license, and not having been convicted of a felony. Participants must register by Jan. 31. For more info see the City's Web site. Not to be outdone, the Public Works Department will be occupying new space on Lilburn Industrial Blvd. The move will make way for future redevelopment of the current location on Railroad Ave.
Additionally, work continues to progress on the realignment of Main Street and the start of the construction on the replacement library and city hall complex. Finally, the city has been exploring the possibility of an entertainment/arts complex. For more info on City News, visit the web site as well as Facebook. 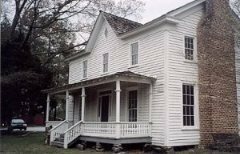 Since acquiring a lease to occupy the Wynne-Russell House, the Lilburn Community Partnership has assessed the maintenance and repair issues of the house which was built in 1826 and is on the National Historic Registry. In order to utilize the house as a meeting and event facility year round, the home needs some some improvements such as insulation, installation of air-conditioning, and touch up painting on the inside. The outside needs some maintenance as well. In order to pay for the needed improvements, the LCP will hold a fundraiser on February 22 which will be a tasting event and silent auction. Sponsorships from restaurants who would like to participate are currently being solicited. Plans are to make the home available for small events, meetings and tours. The home is suitable for groups no larger than 75. If you are interested in volunteering to help solicit items for the fundraiser or sponsorships, please contact Diana Preston through info@lilburncp.com. More to come on event details our February newsletter and the LCP web site Community Bulletin Board page. Gwinnett Libraries are updating their online reserve and checkout services. Between now and January 14 patrons will not be able to use the online services as the library installs a new catalog system called Polaris. Patrons will also need to print their checkout history by January 9. For more information click on Polaris and News. 2014 Budget: Gwinnett Commission Chairman Charlotte Nash formally presented a proposed $1.5 billion budget for fiscal year 2014 to the Board of Commissioners during a briefing on November 19, 2013. After a public hearing and period for public comment, commissioners will vote on the budget proposal on January 7, during their first meeting of the year. Lilburn CID executive director Gerald McDowell was recently interviewed by Gwinnett Business Radio on the purpose of Community Improvement Districts and their goals. Mr. McDowell gives a history of the Lilburn CID, its progress so far and its goals for the coming year. Click on this link to hear the interview. The LCP is proud of its role in helping to forming the Lilburn CID. For more on the LCP's role in this endeavor, click here. As you start 2014, if you haven't already linked to web sites that either help you save for your child's education or funnel a percentage to your favorite school, take the time to check out these web links. We have researched a few of our major retailers, and have found that their give back programs continue to change and that taking a little time now, will help you and our community's schools. Another major retailer, Publix has the Upromise – “Save for College” program where you register your child or future student beneficiary at http://www.upromise.com/welcome must register for a credit card from this website which is also good at Target, Staples, Macy’s, Best Buys and others. The Kroger program allows you to add a benefitting school using your Kroger shopping card through Elabels for Education or by creating an account. Of course there are other programs, but this will help you get started if this is new to you. 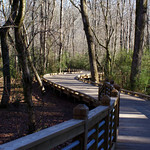 With all the wonderful walking trails in nearby Mountain Park, Bryson Park, Lilburn Park, Lions Club Park and others, now is a good time to consider a New Year's resolution to improve our lifestyles to inlcude walking more. The following article is reprinted from the campaign: Everybody Walk spearheaded by Kaiser Permanente. "The simple act of putting one foot in front of the other has significant health benefits that are explored in “The Walking Revolution,” a new documentary film by Every Body Walk! which aired recently on one of the networks. Every Body Walk! is a campaign aimed at getting Americans up and moving. “Our bodies are designed to move,” said Rob Schreiner, MD, executive medical director of Kaiser Permanente of Georgia. "The Walking Revolution" is a 30-minute documentary that details the health benefits of walking, what makes communities walkable, and how walking and walkability supports a healthier environment, strong local economies, and a vibrant community life. “The Walking Revolution” also motivates viewers to move through inspiring, personal stories. From the registered nurse who lost 70 pounds by incorporating a simple walking routine into his lifestyle, to the “Iverson Mall Walkers” who have kept up a routine of walking one hour a day, three times a week since 1989, these individual stories are examples of how a simple walking routine can dramatically improve health and wellness. “The Walking Revolution” is also available at www.everybodywalk.org/documentary. Add activities to your pet’s daily routine. A nice daily walk around the block with your dog or a 15 minute play session with your cat chasing a teaser will burn calories that will add up over a years time. Make this new year the healthiest yet for you and your pet and you’ll enjoy many happy years together. The Gwinnett Chamber of Commerce is asking small business owners to submit a business plan summary to the Amazing Entrepreneur Contest by March 8, 2014. Grand prize winner receives $5,000 cash & more than $7,000 in prizes. Click for more info. Please feel free to forward this newsletter on to neighbors and friends. Business After Hours, Thu., Jan. 16, 5:30 - 7:30 pm @ 850 Indian Trail Rd.